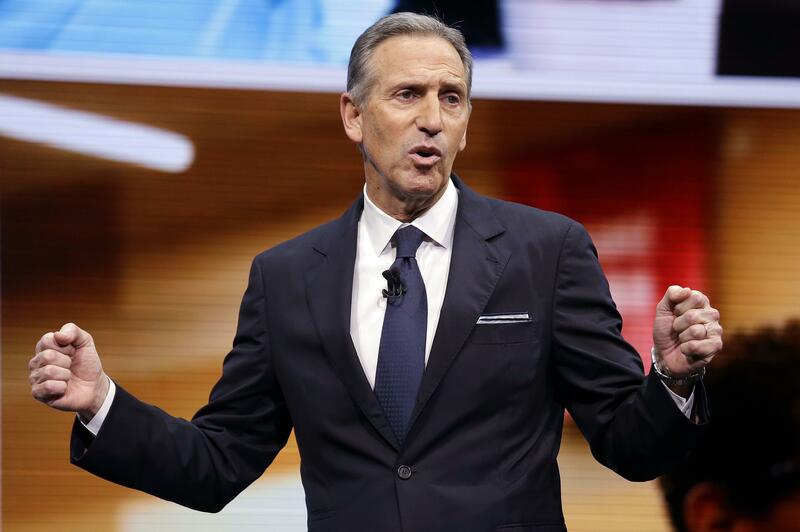 NEW YORK – Starbucks CEO Howard Schultz presided over his last annual shareholder meeting as head of the company Wednesday by standing by its pledge to hire refugees and expanding on previously announced goals to hire veterans and at-risk youth. Schultz, who will remain executive chairman, defended the promise on refugees to a shareholder who criticized his willingness to have the company’s reputation “take a beating” over it. The pledge came after President Donald Trump’s executive order temporarily banning refugees from seven Muslim majority nations, and had prompted some calls for a boycott of Starbucks. “This is not about politics,” said Schultz. He said the company’s decisions were based on “humanity and compassion” and there was “absolutely no evidence whatsoever” that Starbucks has suffered as a result. Under Schultz, the company has waded into sometimes-heated subjects, such as when it had baristas write “Race Together” on cups amid protests over police shootings of unarmed black men. Those kinds of moves were seen by opportunistic by some, but kept the company in the spotlight and won praise among others. Its image has helped make it a focus of criticism, and protesters outside the shareholder meeting called on Starbucks to make good on its commitment to using recyclable cups, while employees called for the same parental leave benefits as managers. It’s not clear what impact Starbucks’ decision on social issues have had on sales. Laura Ries, president of a marketing firm, said it’s risky for big brands to take positions on divisive issues that could potentially alienate half their customers, particularly on issues that are not relevant to the company. “Starbucks is like McDonald’s these days. It’s everywhere, it is appealing to everybody,” she said. Schultz, a Democrat, had endorsed Hillary Clinton for president last year, and didn’t rule out running for office himself. Since he returned as chief executive in 2008, the company has expanded its footprint globally and seen sales growth at home. “We have analysts who believe the bloom is off the rose at Starbucks – they don’t know what they’re talking about,” Schultz said Wednesday. Published: March 22, 2017, 3:29 p.m.